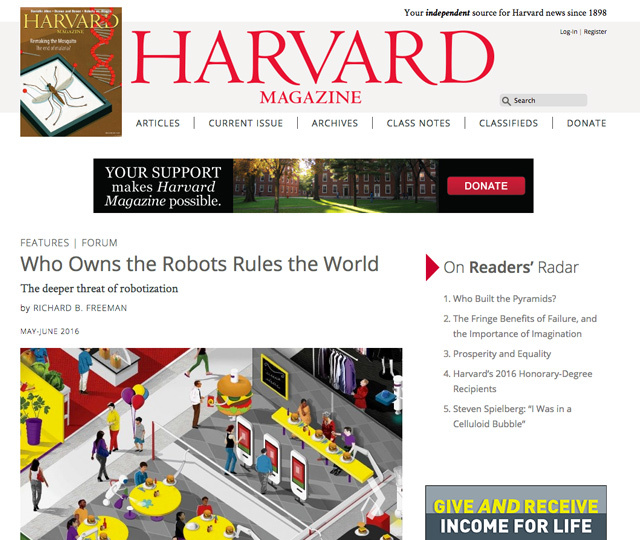 description: I have spent three years running Harvard Magazine’s main web presence. The Drupal site consists of over 50,000 nodes in 10 distinct content types, including articles, class notes, classified advertisements, obituaries, pages, and more. It receives over 300,000 page views a month. In 2015, I initiated and oversaw a complete site overhaul. I hand-picked a team of five coworkers to collaborate through information architecture, design, development, and launch phases. Additionally, the process included a major version upgrade from Drupal 6 to Drupal 7. I also assisted with managing web production, the process by which we digitized each bi-monthly issue. This involved converting InCopy files for print into Drupal-friendly data for insertion. I frequently worked with editors to optimize presentation of content while streamlining Drupal to improve their workflows. I worked with our marketing manager to control advertising throughout the site. I created a custom email generator for output into MailChimp, and more. I am currently optimizing the site for mobile using responsive web principles, and expect to launch the improvements in Summer of 2016.